Scroll below to take a look at the upgrades from multiple teams on the grid. In the warm, dry conditions of Singapore on Friday and Saturday, Mercedes struggled to match Ferrari and Red Bull, as was expected by the team due to previous problems at both Monaco and the Hungaroring. There appear to be mixed messages coming from the team about the reason for the deficit, with some suggesting a lack of slow-speed downforce, while others point to a mechanical grip weakness, which would make itself more pronounced in low speed corners, where aerodynamic performance is less critical. In reality, there is probably a mixture of both, together with other, more detailed explanations. With a lack of major updates for Singapore, Mercedes’ place in the pecking order was never likely to improve markedly, and only a complete change in conditions on race day allowed it to shine. There were, however, some minor updates to the rear of the W08, the most striking one being a new shark fin, with the maximum cross-sectional area possible being used. 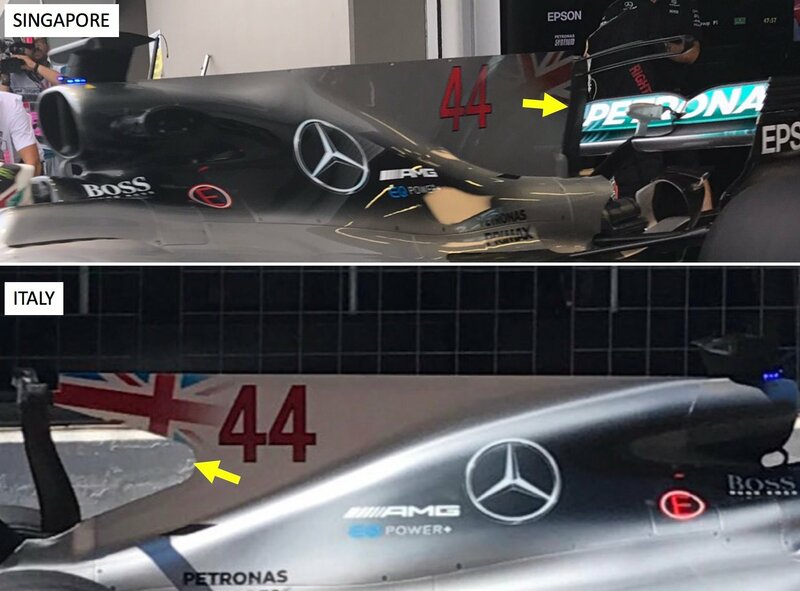 Over the course of this season, Mercedes has gradually extended its shark fin’s area, as it trades off the benefit it provides with the loss from lower rear wing and T-Wing downforce. This can most easily be explained by the scenario of the car being in the state of a rear end slide. As this happens, the shark fin is colliding with a ‘wall’ of air, exerting a force on it. At the same time, by Newton’s 3rd Law, the air must exert an equal and opposite force on the shark fin, moving the car back into line. However, by making the shark fin longer, as well as removing the cut-out, when the rear end steps out, airflow to part of the rear wing and T-Wing is blocked, reducing rear downforce and enhancing the slide. Therefore, a larger shark fin is both beneficial and detrimental to performance, with any overall laptime improvement being minimal. Ferrari had a tough weekend in Singapore, not only leaving with zero points, but also struggling for pace at times through the weekend. While most of the team’s problems were rectified for qualifying, it appears that it is not only Mercedes who are having trouble setting up the 2017 cars on slow speed tracks. 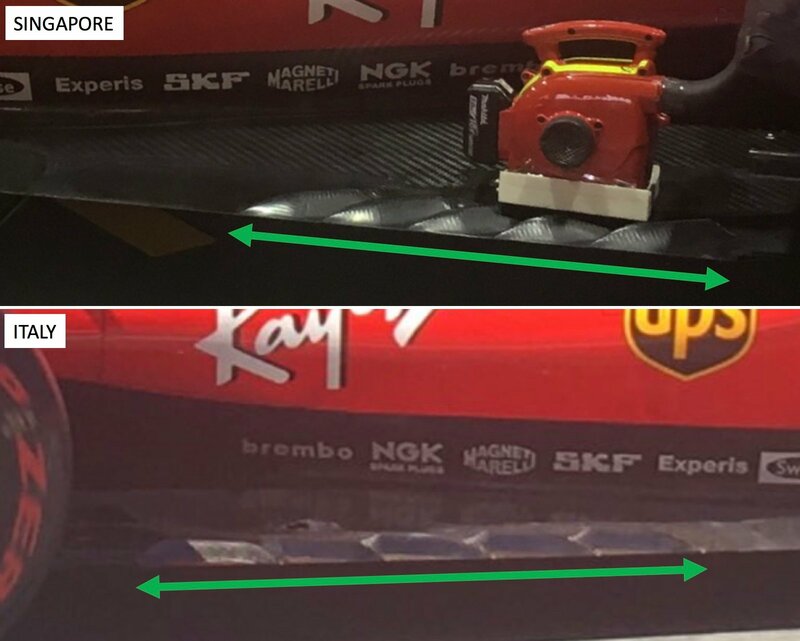 As I exclusively revealed during the race’s preparations on Thursday, Ferrari brought a new floor to Singapore, with the focus again being on the floor slots ahead of the rear tyre, where the fifth edition of the part was introduced. While the number of slots remained the same as before, with one L-shaped slot, and five simpler ones, the spacing between the latter has been decreased noticeably. The result of this is that the slots take up less of the floor area that could otherwise be used for downforce production, especially given the rake that Ferrari runs on its SF70H. It may be the case that the structural integrity of the floor has been improved, so despite the slots being closer together, there is no issue in terms of unwanted flexing at high speed. Running with the slots in closer proximity also allows each of the vortices shed to work with one another, as opposed to separately, in directing air inboard of the rear wheel for lower ‘tyre squirt’ (where air colliding with the wheel is diverted laterally into the path of the diffuser). The geometry of the slots also appears to have been tweaked, with a slightly more angled orientation relative to the edge of the floor, again to improve diffuser performance. Renault continued its upward performance trend in Singapore, aided by a couple of minor updates to its R.S.17 chassis. Before analysing these, it is first interesting to delve into the sector times and speed traps from qualifying. Looking at the numbers, only Vettel and the Red Bulls were quicker in the final sector, while a full eight tenths were given away in the first split, where the team also had the worst straightline speed. This suggests that downforce levels are not a problem on the maximum load tracks, but its efficiency is – this will be a major focus of the team with regards to the 2018 chassis’ development. Moving on to the updates for Singapore, firstly, the leading edge of the front brake duct now features a series of horizontal elements that form a grille-like entry. The previous single horizontal element, which sat further into the duct, has been removed. Using the grille, like Ferrari and Haas both do, has a number of potential benefits. Airflow entering the duct will now be more uniform, eliminating the internal drag that would result from a more chaotic entry flow. Dispensing with this drag also increases the velocity of air leaving the opened front axle, raising the efficiency of the blown axle effect in directing the front tyre wake away from the rear of the car. Lastly, the potential for significant pieces of debris and rubber to enter and block the duct is lowered noticeably, improving reliability. At the rear of the R.S.17, the floor slots ahead of the tyre were revised. The design used prior to Singapore closely resembled that used at the start of the season, and was quite simple. In fact, the new design is even less cluttered, and it appears as if Renault, like McLaren, is looking to simplify this area of the car, while other are making it more complex as each race goes by. 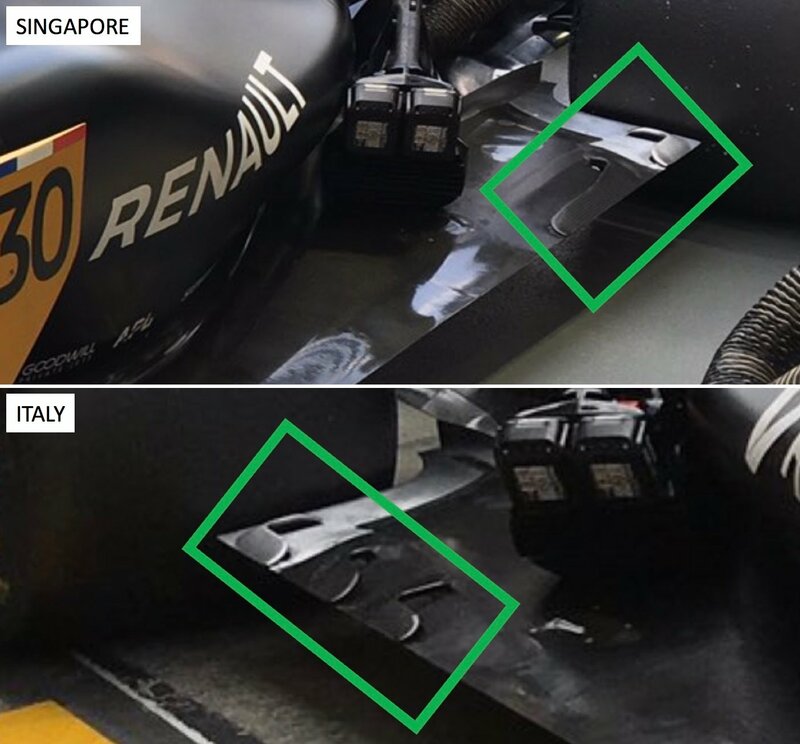 For Singapore, the two most forward right-angled slots were replaced by a longer element. The general philosophy of the design is unchanged – to summarise, it involves the creation of vortices, as high pressure air above the floor spills over to its underside, which draw air inboard of the wheel for lower ‘tyre squirt’, and consequently, improved rear downforce. By effectively combining the two smaller slots into a larger one, the vortex shed will be much stronger – Renault sees the benefit from this more aggressive approach, as opposed to using multiple, weaker vortices in a more controlled manner. 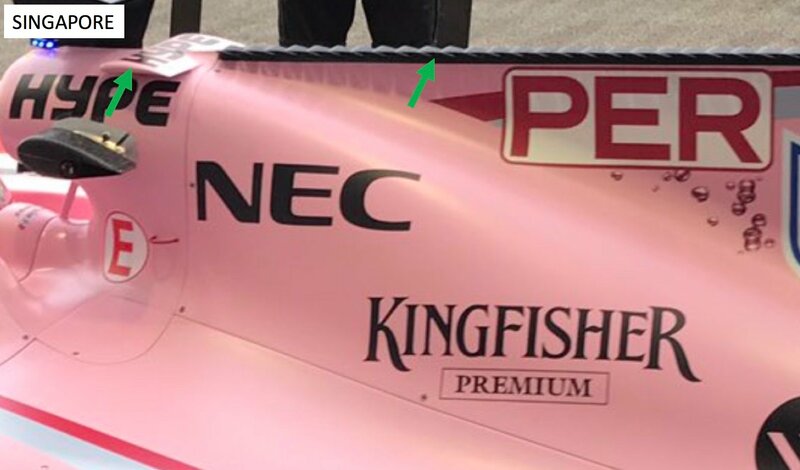 Force India added some aggressive updates to the rear of its VJM10 for the Singapore GP, with the most notable one being along the top of the shark fin, where a series of fins were introduced, together with a small wing just behind the FOM camera. With the news that shark fins will continue to be used in 2018, this concept will also apply, to an extent, to next year’s car, something Force India always focuses on its given its limited budget. Both of the devices mentioned above appear to be designed as vortex generators, with a pressure differential being set-up either side of them. In addition, the small fins will create a downwash on the oncoming flow, ahead of both the T-Wing and rear wing. The creation of the vortices will help to clean up airflow emanating from the airbox area, which tends to be quite messy, by drawing it into energetic, rotating flows heading towards the rear wing and the T-Wing. In addition, with the vortices being close to the car’s centreline, the T-Wing will be worked harder along its most inboard sections, where the contribution to the drag-inducing wingtip vortices is lower, minimising resistance. The downwash from the fins will result in an effective increase in air density of flow travelling to the centre of the rear wing, something which will enable it to produce more downforce. 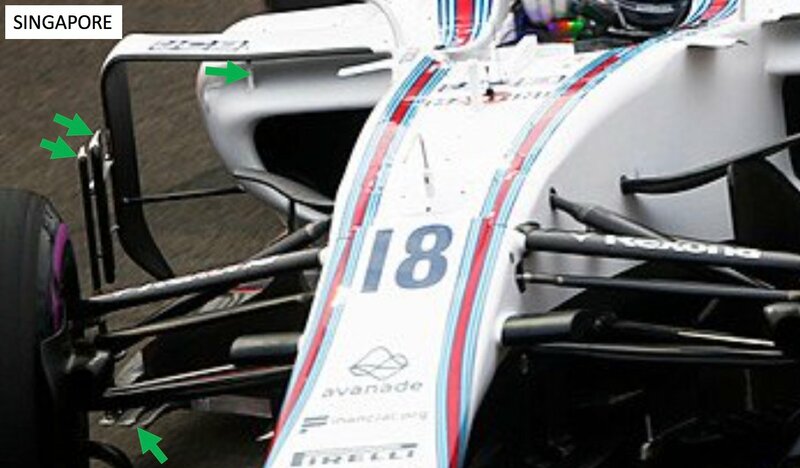 While this will reduce airflow heading towards the T-wing, the downforce lost from this shorter chord device will be less than that gained from the high chord rear wing. In Singapore, Williams continued its update philosophy of bringing developments to its FW40 on a consistent basis, again focusing on the bargeboard and sidepod front area, where there is significantly more regulatory freedom than in previous years. 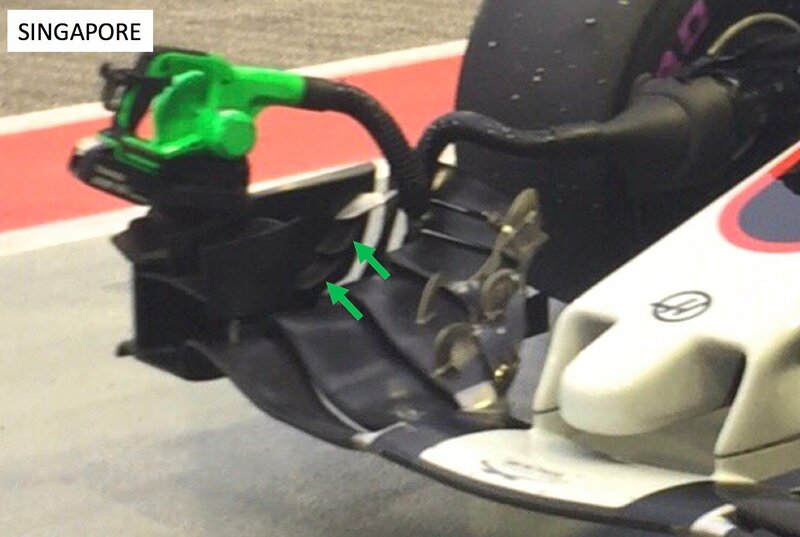 Like on the Mercedes, the Grove team has added two further airflow conditioners ahead of the main element, in order to improve the attachment of airflow to the sidepod as it narrows heavily in the ‘Coke-Bottle’ region of the car. This is achieved by creating a narrow channel between the sidepod and the conditioners, speeding up airflow in this area, and making the ratio of inertial to viscous forces greater, for lower pressure drag. In addition, it appears as if the two new conditioners have wing-shaped vertical cross-sections, both of which would produce vortices, and bring some coherence to the turbulent tyre wake by drawing it into the rotating flows. Elsewhere, the height of the main conditioner has been reduced, with the most forward element being the one that extends right down to the floor, and is directed outward at its base. 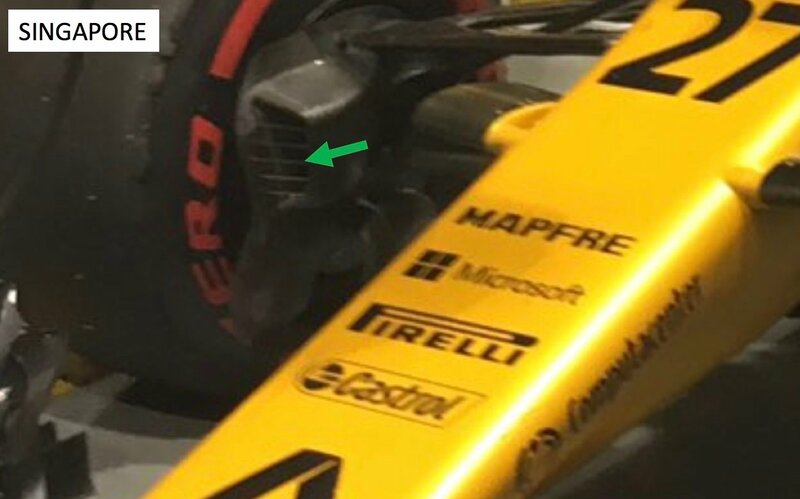 This is aimed at attacking the front tyre wake further forward, along with the bargeboard, for improved rear end load consistency. Also note that the forward extension of the floor is no longer one piece, but has been widened and split into three elements, each with a wing-shaped cross-section (not visible here) and downwash orientation. The former will result in the production of mini-vortices, which are energetic airflows, and combined with the latter, will protect the underside of the car from turbulent air emanating from the front tyre. In addition, the leading edge slat at the top of the sidepod has had its geometry tweaked, as the team again looks to minimise pressure resistance, via a similar method to that mentioned above, but this time along the sidepod’s upper surface. A vertical element now connects this part to the sidepod’s surface, and this may serve a structural purpose, keeping the gap between the two consistent, under all conditions, for optimal flow over the sidepod and to the rear of the car. In Singapore, Haas was once again quiet on the development front, as the team increasingly shifts its limited resources to the 2018 car. The only noticeable update was to the front wing endplate’s inner surface, with the most forward of the elements behind the cascade being split into two, creating a detailed, three-element overall set-up in this area. Considering that the angle of attack of the new two-fin set-up appears to be very similar to that of the single fin, Haas will have been looking to improve the airflow attachment to the underside of the part by reducing the chord of the curved surfaces, as well as allowing air from the upper surface of the initial winglet to energise the boundary layer on the lower surface of the second winglet. The result is lower pressure drag and a more consistent vortex production at the tip of the part, enabling the optimal flow of air over the front tyre to be achieved more often, for minimal resistance and turbulence.